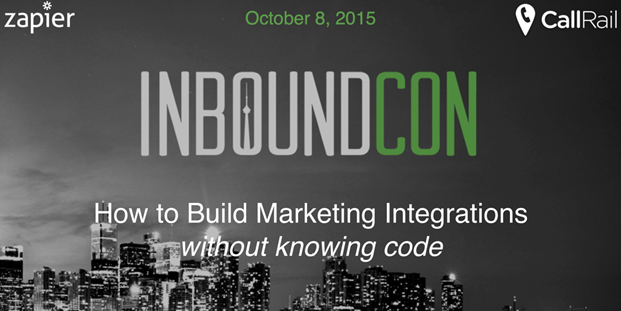 In this post I’ll go over the essence of what we talked about: how to build inbound marketing integrations without knowing code. My goal is for you to begin saving time right away by incorporating some of these tools into your marketing workflows. Are you using some workflow hacks to make your inbound marketing more efficient? If so, what are they? Let me know in the comments section below! The general rule I use to determine whether a certain task is worth integrating or automating is whether it’s repeated for each new account, client, or campaign I set up. Basically, if I’m going to be doing the same tasks over and over again I begin looking for ways to make my life easier by connecting workflows. Below are 2 examples from my past experience that might illustrate the kind of integration/automation I’m talking about. All of my clients would be set up with a dashboard showing them the most important data about the work I was doing for them. I used Cyfe because of its affordability, ease-of-use, and its support for client-user sub-accounts. 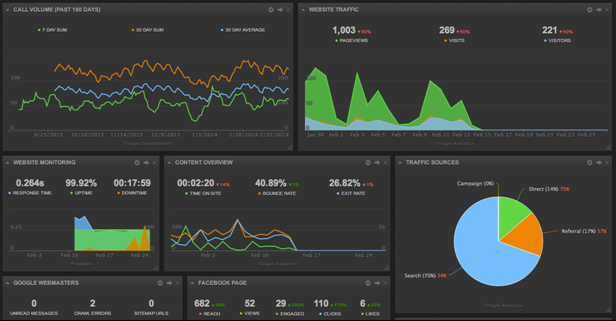 The main KPI I used to set expectations and measure performance for local SEO campaigns was First Time Callers. I would ask my clients to judge my work on this metric, above all else. Unfortunately, Cyfe didn’t have a native integration with CallRail, which is where I tracked all phone call activity for my clients. (Note: CallRail offers Canada call tracking numbers as well as U.S.) I found myself creating reports on call volume every month for every client and decided there had to be a better way. With CallRail’s Zapier integration I was able to have CallRail send data over to Zapier each time there was a new phone call, which would then trigger Zapier to create a new spreadsheet row in Google Sheets. From Google Sheets I set up formulas to automate the calculations I was doing to pull out the metric of First Time Callers on a separate tab (referencing the up-to-date data coming in from CallRail via Zapier). Then I pointed a data visualization widget within Cyfe to the summary tab with all the final calculations. For new clients that came onboard, I simply copied the spreadsheet with all the formulas, removed the call data, and set up the Zapier connection to automatically pull the information on calls for the new client. I ended up saving tons of time and my clients got a dashboard they could see whenever they want to judge the performance of the campaign. Note: CallRail recently released a new and improved Zapier integration that is more powerful than ever. When I sold a new client on a marketing services package that included local citation clean up I knew I’d be monitoring those citations for any changes/updates for 3 main reasons: 1. To know when updates I submitted took effect so I could communicate it to the client; 2. To monitor the citations for any changes that might affect NAP consistency; and 3. To know when new reviews were published to that business listing so I could communicate this to the client. There are tools that take care of this for you now but I wanted to avoid extra monthly costs for each new account because it would eat into my profit margins of the account. So instead of manually visiting each citation to see if any changes had been made I would set up a free tool called Page2RSS that would monitor the page for any changes and alert me via an RSS feed. That way I would be able to review the RSS feed for any and all changes to the listing without having to visit the page itself. This easy hack also saved me significant time and money. As inbound marketers our job is to produce leads for our clients. Every minute we spend doing repetitive tasks is a minute we could be spending figuring out new ways to produce results for our clients. So how can you get started automating your workflows with these simple integrations? First, you need to understand some of the tools that can help you build custom, integrated workflows without knowing code. Let’s go over some of these. Tools like Zapier, the one I mentioned above, are built around connecting apps or software services that businesses use everyday. These connections can be customized according to the data you want to share between apps and exactly when you want the data to be shared (through filters and conditions). The basic way these connector apps operate is on Triggers and Actions. Bottom Line: Connectors are remarkably versatile, affordable, and powerful. I use Zapier all the time to make my work life easier. Many services you’re probably using today for your marketing have a handy, built-in way of sharing data from their platform to another, as well as receiving data from other platforms. Webhooks are what makes this magic happen. They are simple URLs that are used to post information from one app, to be received by another app. Most popular CRMs are able to ingest data from webhooks and most advertising tools incorporate webhooks for sending data out of their platforms. Bottom Line: Webhooks are powerful and simple. In the absence of a direct integration or an easy workflow via a connector app, I always look to use webhooks. Lastly, there is an entire class of tools that I lump into the category of Automation. These are tools that help you automate workflows you repeat on a regular basis by recording the actions and allowing you to replay the workflow. I’ll touch briefly on 3 tools that I’ve used to record repetitive tasks. Macro recording in Excel: This is a powerful and easy way to eliminate the hassles of custom reporting we marketers do month after month that require calculations and formatting. I have used Excel macros extensively in my marketing reporting namely because a simple record button allows me to automate complex formulas, calculations, and formatting that I do to create client-facing reports every month. For a good website on Excel tricks like this go to www.contextures.com. Browser automation: There are several tools that help you record repetitive browser actions and data entry. The one I’m most familiar with is iMacros, an oldie but a goodie. I’ve used iMacros for click recording, data entry and, most importantly, data extraction. Screen recorders and screen captures: If you’re not already using some easy tool like Jing for screen captures, you’re likely spending more time than you need explaining things to your clients over the phone or in person. Often a quick screenshot with some arrows and text can save you time otherwise spent explaining something. Same with multiple-step tasks that you want to show a client how to do online–you can record it once, send it in the form of a hyperlink, and reuse it for other clients that might need similar training. I’ve saved so much time using Jing it’s really hard to imagine working without it. As you get started making your plans for 2016, keep in mind that you could likely automate a lot of what you’re doing now with these simple no-code integrations and marketing workflow hacks. Remember the rule of repetition: If you’re going to repeat X task for every new client, campaign, or account, then it’s worth some thought to determine whether you could make that task more efficient. Make 2016 the year of efficiency and begin diving into these tools and workflow hacks from day one!